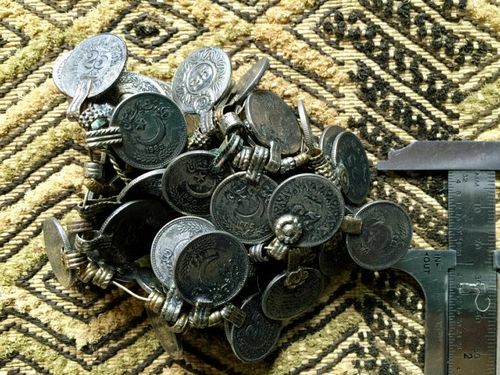 These old Afghani coins have a soldered brass hanging loop and are great to use for pendants or charms. Sold in packages of ten coins. These are all small: the average coin has a denomination of 25 and is approximately 17-18mm-22mm diameter (approx ¾ inch to 7/8 inch plus bail). 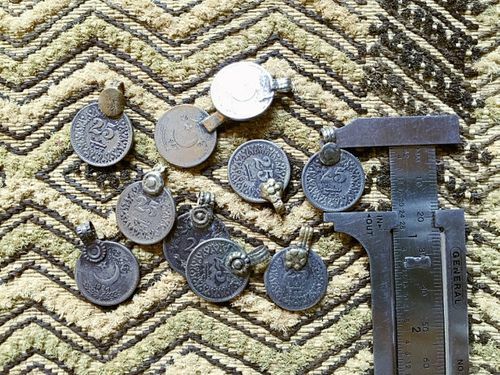 All are have a soldered loop and decorative embellishments on the bail. COMPOSITION: Base metal alloy containing copper, brass, nickel and other metals. CONDITION: Please note that the coins are used and show signs of wear and tarnish. 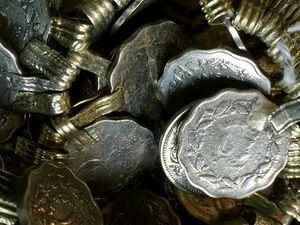 Coins may contain discoloration, rust and/or patina and are not in new condition. Late 20th century, used from Afghanistan. You will get a package of small, coins in the size range of 18-22mm. Coins may contain discoloration, rust and/or patina and are not in perfect condition. You can clean them by soaking in Tarn-X for a minute or two (maximum) and then washing with anti-bacterial soap and water. Dry on paper towels.